 Crislo is the trusted source for the provision of foreign domestic labor. As recruitment agency, we deploy maids from Indonesia, Philippines, Myanmar, India, Sri Lanka and other parts of Asia. 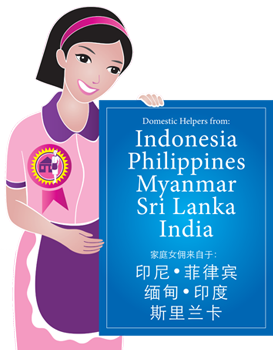 Our broad reach allows for scrupulous selection of good domestic helpers from around the region, employed by both locals and expatriates. Employment Agent and Recruitment Consultant, Ms.Cristie Low has been in business in Singapore for many years now. She has pioneered and has been leader in the field of both local and foreign employment and maids’ placement services. Many businesses and families have greatly benefited from her services. Managed by dedicated trained professional team, we can be depended on to provide affordable rates which are only surpassed by our integrity and commitment for customer care to quality service. With our many years of experience, we have successfully found employment for countless foreign workers in Singapore and in neighboring countries. Ms. Cristie Low is known for her work as a means of contributing to society. Providing employment placement services demonstrates much of her passion, care and concern towards those who needed assistance. 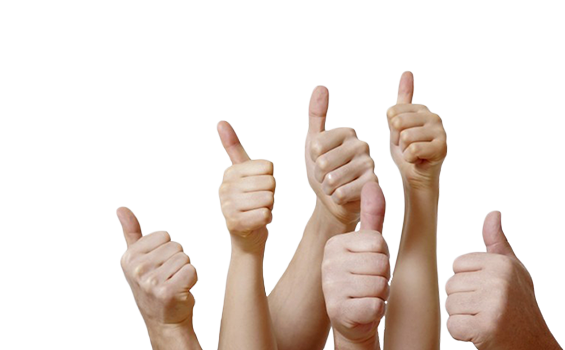 Fantastic service which helped me immediately, Jan was wonderful, has a lovely personality. Her company and help was greatly appreciated. My family are all grateful for the service and highly praise it. Thank you all so much! I had Mary working with us for 3 years. During those years I thought she was a big help and very nice to speak with. This service is great and I would accept help from you any-time. Thank you very much. Very much appreciated. We were looking for the perfect helper and we found her at Crislo Employment. We are so happy and recommended the company to many of our friends and colleagues. Copyright © 2013 CRISLO Employment Agency Pte. Ltd. | License No. : 95C3707 | All Rights Reserved.